AR, VR and MR: Which reality is right for you? Technology like smartphones and social media changed how billions of people work, communicate and socialize. Yet, when they first emerged, many questioned their relevance for business and marketing. Virtual reality (VR), augmented reality (AR) and mixed reality (MR) are on a similar path and these emerging technologies are redefining how companies market, sell and support customers. Their potential to solve real-world business problems is exciting and usage is predicted to skyrocket in the next few years. Think about the business problems you face today that impact your bottom line. What’s costing you sales or customer attrition? 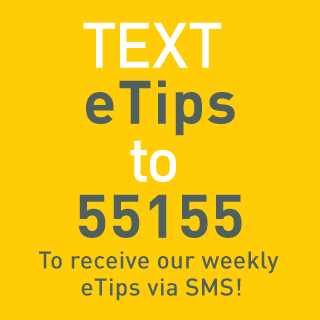 What are your internal training challenges? These new technologies may just solve those problems. 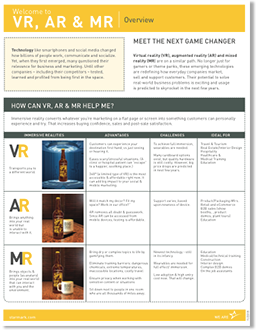 Find out how AR, VR and MR can help your business succeed with our “Welcome To AR, VR and MR” cheat sheet that demystifies the emerging technologies and explains how you can apply them to your business.